I'd steer well clear of this neighborhood. All too often watching a movie one gets the sense that the movie went into production before anyone actually knew the plot, that the film was made based on a one-paragraph synopsis and signed contracts with a few actors. Then, while the initial idea may have been great, the screenwriters and director find themselves completely unsure of how to flesh out the single paragraph into a two hour film. As an example of this might work one only has to look at the upcoming Blu-ray release, Lakeview Terrace. 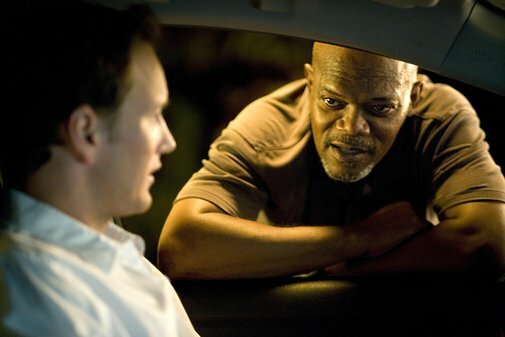 Directed by Neil LaBute (In the Company of Men), the film stars Samuel L. Jackson (who was signed to the part before LaBute came on board according to the featurettes), Patrick Wilson, and Kerry Washington. Wilson and Washington are Chris and Lisa Mattson, an interracial couple that has just bought a house on Lakeview Circle in Los Angeles (yes, the film is Lakeview Terrace, and while that may be the neighborhood, it isn't made truly clear and certainly isn't the name of the street). Jackson plays Abel Turner, their next door neighbor and a member of the Los Angeles Police Department. While everyone in the neighborhood seems to really like Abel Turner and love having a police officer for a neighbor, Chris and Lisa feel differently. They quickly come to recognize something dark and ominous lurking beneath Abel's jovial exterior. It tur ns out that Abel doesn't like interracial couples and would rather not have one living on his block. Abel then proceeds to terrify and torment the Mattsons in an attempt to get them to move. The film has the feeling of being pitched to the studio as "what if there was this cop whom most people thought was nice, but he wasn't. What if he hated his neighbors, what would happen when they tried to tell the police about this one officer?" None of the reasons for the bad cop's being bad were worked out, no clear idea was had as to what exactly the bad cop would due to torture his neighbors, and no explanation was given for how this cop could be so bad and yet have fooled the rest of his neighbors. In the film, Abel is so unhinged that he torments the nice interracial couple, not the neighbor who beats his wife. 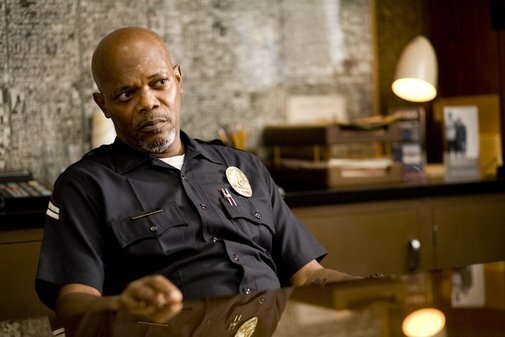 Eventually, Lakeview Terrace does provide a reason for Abel's actions, but never one for how he could have fooled the rest of the neighborhood. However, the reason Abel gives to Chris is so ludicrously silly that one can't truly fathom how it is that Abel manages to cover his bad guy attitude in his day-to-day life. Nothing in the film seems truly thought out. The Mattsons have purchased this house as a "starter house," but what the audience is shown is the single nicest starter house ever created. Not only is it huge with a gorgeous view, but it seems brand new inside and has a lovely large pool, hot tub, and barbecue area in back. The folks working out the locations and sets clearly were not thinking "starter house." It is the sort of disconnect that is present throughout the whole film. Even when the end of the movie mercifully arrives, one can't shake the feeling of how downright foolish everything that transpires actually is. Abel gets what's coming to him in a finale that either defies logic or proves the hero to actually be a bad guy. The audience is left to decide whether the screenwriters (David Loughery and Howard Korder) simply wanted to see the bad guy "get it" no matter or what if they were trying to say that, in the end, Chris is a villain as well. This last idea is a notion that is sort of supported through the film, Chris certainly allows himself to be provoked by Abel more than he ought. However, if Chris is a villain one has to conclude that the film comes down against interracial couples, something it surely cannot mean to do. Jackson is certainly the star of the piece, and gives it his all in scenery-chewing Snakes on a Plane mode. It's a performance that one feels Jackson gives all too often these days in lieu of his actually developing a character. The Blu-ray release contains the required deleted scenes, behind-the-scenes featurettes, and cast and crew commentary. Nothing in the behind-the-scenes pieces ever really explains away all the inconsistencies, plot flaws, logic gaps, and other errors with which the film is loaded. The Blu-ray also will contain some BD Live features when it is released on January 27th. As for the technical side of the disc, the image looks good, though is certainly not spectacular. The 5.1 channel sound seems to hardly ever be taken advantage of, there is a street scene early in the film where the traffic noise is directed to the rear speakers to good effect, but when a wildfire threatens the homes, the sound doesn't seem to back up the visuals. In the end, the basic notion behind Lakeview Terrace is a good one, and a one paragraph synopsis makes the film sound intriguing. However, that one paragraph synopsis is never really turned into a full-fledged film.